This abstract from a 2007 review  summarizes the rationale for injecting clodronate liposomes into arthritic joints. Furthermore, intra-articular injection of clodronate liposomes into human subjects is the only reported clinical use of clodronate liposomes to date , although an intravenous liposomal alendronate formulation for the treatment of vascular restenosis is in Phase II clinical trials . Overall, the literature on liposomal clodronate dosed by intra-articular injection includes almost as many therapeutic studies as mechanistic studies related to the depletion of synovial macrophages. The publications that we have reviewed thus far generally recognized that the application will apply to any and all affected joints. While the therapeutic application of intra-articular injection would seem impractical for conditions such as rheumatoid arthritis which may involve many joints simultaneously, other types of immune-complex arthritic diseases as well as osteoarthritis may be focused in only one or two joints during an episode requiring treatment. Liposomal drugs have been investigated for the treatment of arthritis [8, 13, 16, 18, 20, 21] using both the intra-articular and intravenous routes of administration. Imaging studies have shown that intravenously-dosed small liposomes extravasated into arthritic joints in humans presumably due to the inflammation-mediated disruption of the vascular endothelium . 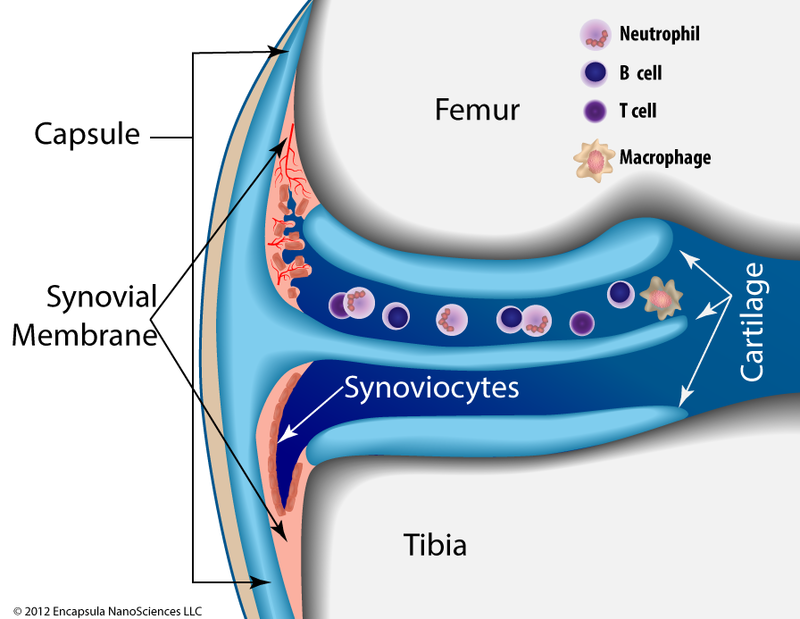 The lining of the synovium consists of a layer of synoviocytes which are designated as type A (macrophage-like) or type B (fibroblast-type) covering the synovial (connective) tissue, however these cells are not interconnected as in other endothelial lining cells. The type B synoviocytes, while not characterized as “macrophage-like” have been shown to endocytose ~200 nm latex particles . The type A cells can be depleted by an intra-articular injection of clodronate liposomes in normal (non-arthritic) mice . Despite the use of clodronate liposomes in the 200 nm size range, Barerra, et al., as well as other groups, report that type B synoviocytes were not affected by the treatment . Below this cellular lining is a network of loosely woven connective tissue whose production and degradation is controlled and carried out by chondrocytes . The limited blood supply in this tissue necessitates that the chondrocytes function under low O 2 conditions, while their unique ability to gather nutrients (primarily glucose) and exchange metabolites via diffusion from the articular surface and subchondroidal bone ensures that they, but not other cell types, can survive in this austere environment. When inflammatory cytokines and chemokines do invade the synovial space, chondrocytes become major players in the body’s attempt to maintain normal cartilaginous structure, however some have shown that the inflammatory cascade is deadly to chondrocytes  thus limiting their ability to participate in joint tissue maintenance during the inflammatory crisis. Although intra-articular clodronate liposome treatment was shown to spare chondrocytes, a short, low-dose oral dexamethasone co-treatment was required to prevent significant loss of proteoglycans (cartilaginous tissue) as discussed in more detail below. The lower section (above the tibia) represents a normal knee synovium and the upper section (closest to the femur) shows the early phases of rheumatoid arthritis. Taken from Choy and Panayi . In this figure of a knee joint, the lower part (closest to the tibia) of the synovial space shows a normal synovium with an intact layer of synoviocytes. The upper section (closest to the femur) represents the early stages of rheumatoid arthritis (RA) . Inflammatory cells enter the synovial fluid releasing cytokines which induce the synovial tissue to become thickened and irregular (hyperplastic). The hypertrophic synoviocytes no longer form a smooth layer atop the hyperplastic synovial tissue thus exposing it to cytokines that induce inflammatory cell infiltration and angiogenesis. Once the synovium develops its own, more robust, circulatory access, inflammatory cells from the bloodstream now have direct access to the synovial tissue and the blood supply enhances the tissue’s ability to increase in volume. As the disease progresses, neutrophils become the predominant inflammatory cell in the synovial fluid; the synovium continues to thicken further invading the synovial space. The chronically inflamed synovium ( pannus ) eventually begins to invade and degrade the surrounding cartilage and will eventually reach the bone. By this time, the inflammatory cascade has solicited more macrophages and directed them to further mature into osteoclasts whose function is to degrade the ossified bone tissue. Thus, advanced RA involves degradation of the joint cartilage as well as destruction of the bone . Many other reviews, some of which are listed below [8-18, 37], discuss the mechanisms, etiologies and treatment methods for RA and osteoarthritis (OA). OA is initiated by wear- or injury-related damage to the joint cartilage rather than an unknown immune initiator, however the resulting inflammation also leads to the ultimate destruction of the cartilage and bone. Macrophage depletion in normal (non-arthritic) mice was maximal at day 7 post-injection of clodronate liposomes  at which time few or no macrophages (70-100% depletion) were found in joints by immunohistochemical staining for F4/80+MOMA-2+ cells. Macrophages began to repopulate the femoral side of the synovial lumen surface on day 9 and completed repopulation by day 15 at which time the lining on the tibial side of the joint began to reappear and was about 60% complete by day 30. On days 1 and 2 post-clodronate, but not control, liposome injection, proteoglycan (cartilage) synthesis is significantly inhibited, although proteoglycan degradation occurs at about the same level as proteoglycan synthesis, and some inflammatory cells enter the synovium. These effects were resolved by day 3 post-injection. Therefore, complete depletion of synovial macrophages is transient (± 2 days) but repopulation is quite slow presumably requiring 1.5-2 months or more for full repletion of the synovial lining. van Lent, et al. also showed that depletion of synovial macrophages inhibited inflammatory cell infiltration into the synovium and significantly reduced IL-1β levels in animal models of collagen-induced arthritis . This group further demonstrated that synovial macrophage depletion inhibited chondrocyte death, as discussed above, but cartilage destruction was only derailed when a brief, low-dose oral dexamethasone regimen was included 2 days before, after and on the day of liposomal clodronate treatment . The authors speculate that the low level of inflammation observed upon intra-articular injection of clodronate liposomes is enough to initiate sustained cartilage destruction in arthritic mice. 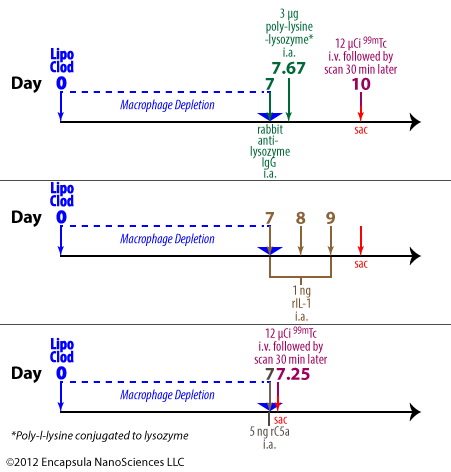 This group previously observed that intra-articularly injected fluorescent control liposomes do not localize as extensively in the synovial lining when given during the acute phase (days 0-3) of arthritis onset (see upper timeline and data table below) as when dosed during the chronic phase (day 7). Looking at both the synovial lining tissue and synovial fluid exudate at day 1 post-arthritis induction after a dose of fluorescent clodronate liposomes was injected intra-articularly, the injected fluorescent clodronate liposomes were found almost exclusively in the exudate at 6 hours (day 1.25) post-injection with no liposomes found in the exudate at 1 (day 2) or 3 (day 4) days post-injection. The very low level of liposomes which was associated with the synovial lining did not increase from the 6-hour level at later time points suggesting to the authors that very little macrophage uptake of the liposomes occured in the acute phase. Experimental timelines for van Lent et al. who state that the acute phase (day 1) arthritis is characterized as having extensive neutrophil infiltration for the first week while the chronic phase (day 7) arthritis exudate is dominated (starting on day 7) by macrophages and T cells. Conversely, fluorescent clodronate liposomes which were dosed on day 7 post-arthritis induction demonstrated “marked” (highest score) uptake in both lining cells and exudate cells at 6 hours (7.25 days) post-injection. The fluorescence in both lining and exudate had decreased, but was still moderate (lining) and slight (exudate), by 1 day (day 8) post-arthritis induction and remained constant in the lining, but disappeared from the exudate by 3 days (day 10) post-injection. 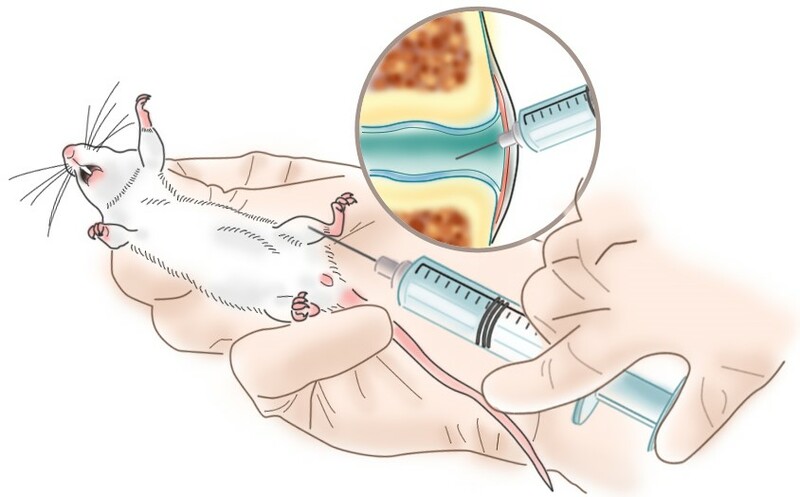 Control tissues, in which fluorescent clodronate liposomes or fluorescent control liposomes were injected into non-arthritic animals showed no uptake of either type of fluorescent liposomes in the exudate cells at any time (1 or 3 days) post-injection. Uptake in the lining cells was “moderate” at 1 day post-injection for fluorescent control liposomes and was reduced to “slight” by day 3. However, uptake of fluorescent clodronate liposomes was only “slight” on day 1 and just detectable on day 3 post-injection. The authors state that the reduction in lining uptake was due to the destruction of the lining cells, presumably synovial macrophages, by the fluorescent clodronate liposomes. We should note here that actual fluorescent clodronate liposome uptake is difficult to assess since macrophages which are killed by fluorescent clodronate liposomes (prepared with a lipophilic fluorophore) will likely generate apoptotic bodies which are also fluorescent and will be subsequently taken up by other macrophages. Therefore, it is possible that macrophages which have not taken up liposomes, but have encountered fluorescent macrophage debris, will be fluorescent. It is also possible that the liposomal fluorophore is diluted into the various membranes of the cell to such an extent that the resulting cellular debris does not contain a high enough concentration of fluorophore to be detectable. While we are not aware of any studies which analyze the apoptotic bodies generated from macrophages killed by fluorescent clodronate liposomes, we assume that it is also possible for the apoptotic bodies to contain enough clodronate captured from the cytosol of the dying macrophages to render the apoptotic bodies toxic to other macrophages as well. Overall, this means that assessment of the extent of cellular uptake of fluorescent clodronate liposomes will be questionable, at best, and really cannot be compared to the uptake of fluorescent control liposomes with respect to fluorophore distribution unless further studies on the fate and products of fluorescent clodronate liposome-treated macrophages are conducted. The authors interpret the lack of uptake of fluorescent clodronate liposomes by cells in acute phase arthritis to be a consequence of extensive neutrophil influx during the first week post-induction of arthritis. Subsequently they were able to show that clodronate liposomes caused aggregation of activated neutrophils in vitro; control liposomes also caused aggregation, but to a lesser extent while free clodronate did not induce any aggregation. Additionally neutrophil lysates caused aggregation and apparent disruption of clodronate liposomes. Thus the authors concluded that neutrophils were indeed responsible for preventing liposomes from being taken up by synovial macrophages. We agree that this appears to be a reasonable explanation, however if neutophil binding and aggregation is the culprit in vivo, were these aggregates present in the cell exudate in the initial experiment described above? And, wouldn’t we expect to see synovial macrophages phagocytosing these aggregates of fluorescent liposomes and neutrophils? Regardless of the route, it seems that the fluorescent liposomes should end up in synovial macrophages, yet the liposomes injected into the acutely arthritic knees just disappear somewhere between 6 and 24 hours post-injection. This model further presumes that the neutrophil-clodronate liposome aggregates are not toxic to macrophages which means that this aggregation phenomenon must have also resulted in the release of clodronate from the liposomes. No fluorescent control liposomes or PBS were dosed to arthritic animals nor were untreated control groups included. Given the complicated scenario discussed above for fluorescent clodronate liposomes, fluorescent control liposomes or other controls may have provided additional data. For example, could clodronate liposomes exacerbate the acute phase arthritis by depleting some of the macrophages which are critical for removing cellular debris resulting from the death of the apparently short-lived neutrophils? The other experiments performed for this paper involve evaluating the ability of clodronate liposomes to prevent synovitis (inflammatory cell influx) when dosed to chronic phase arthritic mice (see lower timeline above). A single dose of intra-articularly injected clodronate liposomes given 7 days post-induction of arthritis prevented synovitis as long as 35 d post-arthritis induction at which time the control animals appeared to be recovering from the synovitis without intervention. Free clodronate dosed at 7 days post-arthritis induction produced a lesser, but significant, inhibition of synovitis as well. Could free clodronate have been effective when dosed to acutely arthritic animals? Several animal models have been used to evaluate the effect of macrophage depletion on the course and severity of both RA and OA including evaluating clodronate liposomes as a potential therapeutic treatment for the disease in humans and animals. van Lent, et al.used a model for immune-complex-mediated arthritis (ICA) which employed lysozyme as the antigen . A high density of positive charges, such as on poly-lysine, on the antigen has been shown to enhance the residence time of the antigen in the synovial space through electrostatic interaction with joint tissues . Therefore, poly-l-lysine was conjugated to lysozyme to increase its availability for immune-complex formation and the residence time of that complex within the joint. Experimental timelines for induction of PLL-induced arthritis in mice by van Lent, et al. (1993) and Blom, et al. (1999). To initiate the arthritis, anti-lysozyme polyclonal Abs from rabbits are dosed intra-articularly to mice followed by an intra-articular injection of poly-lysine-lysozyme (PLL) 16 hours later. In some experiments, either control liposomes or clodronate liposomes were injected 1 week prior to arthritis initiation. The animals were evaluated either by quantitating the amount of intravenously administered 99m Tc retained in arthritic joints or by histological analysis. The arthritis developed within 3 days of induction. As mentioned above, Čeponis, et al. appear to have assumed that intact clodronate liposomes remain in the synovium for 7 days post-injection . We believe that they have assumed that the time to maximal macrophage depletion, 7 days, means that clodronate liposomes remain in the synovium for 7 days. As we know from intravenous clodronate liposome studies, the clodronate liposomes are only in the bloodstream for a few hours, yet, depending on the macrophage population of interest, maximal depletion takes 1-3 or more days. While clodronate liposomes and/or free clodronate may remain extracellular and detectable for a longer period of time after administration to some local sites with specialized endothelial barriers, the synovial lining does not contain tight junctions between the cells, nor are the cells described as endothelial in function or structure. As discussed above, the synovial lining consists of macrophage- and fibroblast-like cells. Therefore, we do not expect free clodronate to remain in the synovial space after it is released from liposomes or dead/dying macrophages. As for intact liposomes, fluorescent liposomes are not observed in the sub-lining synovial tissue and clodronate liposomes have not been shown to affect synovial fibroblasts, however, we are not aware of any data in which the penetration of liposomes into the sublining is visually investigated once the lining macrophages have been depleted. The authors, themselves, show that clodronate liposome persistance is unlikely because they report the uptakeof fluorescent liposomes by synovial cells within the first 6 hours after injection. As we have repeatedly emphasized, liposomes that are phagocytosed will unavoidably be digested by the phagocyte within several hours. These liposomes apparently contained so little clodronate that they were not cytotoxic, as was the goal of the authors, nonetheless, they will be endocytosed within the first 24 hours or less and be subsequently digested. And, until the cell that phagocytoses the liposome dies, the clodronate will remain inside the cell. Clodronate that is released by liposomes before they are endocytosed will quickly diffuse from the synovium. Therefore these animals were exposed to liposomal clodronate for perhaps 24 hours, once per week. The authors cited Highton, et al. in their claim that liposomes remain in the synovium for 7 days post-intra-articular injection, however we find no such data in this paper . As a matter of fact, Highton, et al. stated that fluorescent “liposomes had dispersed by 24 hours.” Additionally, a hydrophobic lipid probe (BODIPY-PC) was used in these studies as opposed to the hydrophilic fluorescent probe (calcein) utilized by Čeponis, et al. and the results from these two types of probes are often very different. As discussed earlier, van Lent, et al. do report that “fluorescent liposomes” were still visible in the synovial lining at 7 days , however the presence of the lipophilic fluorescent probe does not mean that intact liposomes were present. As liposomes containing fluorescent lipophilic probes are digested, the probe becomes integrated into the cellular membranes so that the cell membranes and/or intracellular organelles become fluorescent. Experienced microscopists may be able to differentiate fluorescent liposomes from intracellular organelles in confocal microscopic images, but these types of images were not shown in this paper. Even if we were to accept that intact liposomes remained in the synovial lining at 7 days, this data cannot be extrapolated to say that intact liposomes containing clodronate would be present. A lipophilic probe cannot be used to project the behavior of a hydrophilic compound, such as clodronate. If the goal is to predict the behavior of a hydrophilic compound, then a hydrophilic fluorophore must be encapsulated into the aqueous space of the liposomes as was used by Čeponis, et al. When a hydrophilic fluorophore is encapsulated, even if the liposomes retain their basic vesicular structure but become “leaky” due to opsonization or other enzymatic/macromolecular interactions, the hydrophilic fluorophore will be released from the liposomes and the liposomes will loose their punctate fluorescent signal as is very commonly seen in time-lapsed confocal images of phagocytosed liposomes. 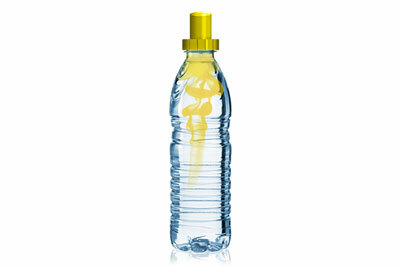 The released hydrophilic fluorescent probe will be diluted to a diffuse background fluorescence or perhaps be quenched by intracellular molecules. However, if punctate fluorescent images persist when liposomes encapsulating hydrophilic fluorophores are introduced into the cells/tissue, the liposomes must be intact [33-35]. In any case, the only way to definitely determine whether clodronate, either still inside liposomes or having been released from the liposomes, is present in the synovial fluid, lining or sub-lining is to track the clodronate by chemical assay or using radiolabelled clodronate (ideally a double-label study with radiolabelled clodronate encapsulated in radiolabelled liposomes). Currently we know of no evidence that liposomal clodronate would be constantly present in the synovial fluid throughout the experiment as we believe the authors intended and assumed in their data interpretation. Free clodronate controls were included in very few studies in which intra-articular clodronate liposomes were dosed, and we have already discussed that free clodronate will probably diffuse quickly from the synovium. However, van Lent, et al. report a small, but significant, effect of free clodronate on synovitis (influx of inflammatory cells)  suggesting that it is always prudent to include a free clodronate control in any study. Once again, we have to emphasize the importance of characterizing clodronate liposomes minimally for clodronate and lipid concentrations. Who accepts dosing an unknown quantity of drug to animals for efficacy studies as rigorous science? 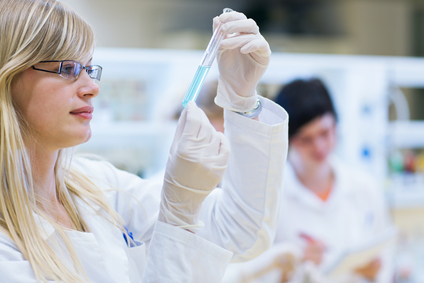 In order to build upon particularly interesting experimental results from any lab, another lab must be able to reproduce those results. If the therapeutic formulation responsible for generating these results cannot be standardized by, at least, drug concentration between labs, the results will undoubtedly be a plethora of conflicting results along with wasted time and money. Variability in Liposome Preparations: Only a few of the papers reviewed in this section state that the clodronate concentration in the liposome preparation was verified by assay and we don’t recall any papers that reported lipid concentrations. The clodronate and lipid concentrations from liposome preparations cannot be assumed to be the same from prep to prep especially when a standardized preparation protocol is not used as is the case in many of these papers. In the majority of papers, sufficient detail of the preparation method such that the preparation could be reproduced is not published. Unfortunately, this is not unusual, but it makes the characterization of the end product of the preparation even more important. During the preparation of multilamellar clodronate liposomes (aqueous clodronate added a thin film of dried lipid), a large portion (85+%) of the component lipids and encapsulated clodronate is usually contained in the 1-3 µm population of liposomes. However, this preparation method does not exclusively produce micron-sized liposomes and while the majority of lipid is contained in micron-sized vesicles, if we look at the size distribution by number of liposomes, as many as half or more of the vesicles are in the submicron range. The sedimentation of these smaller liposomes is extremely dependent on the g-force, temperature and centrifugation time used to separate the liposomes from the bulk solution. Smaller liposomes at low concentrations are not very visible in aqueous suspension nor is it unusual to find a cloudy supernatant in the initial wash cycle. If the supernatant is cloudy, it is because liposomes are suspended in it, but if the supernatant is clear, it doesn’t necessarily mean that there are not small liposomes in it, therefore it is impossible to know what proportion of the clodronate liposomes remain in suspension. Those remaining in the supernatant will be discarded when the supernatant is removed from the liposome pellet. Therefore, the variability between preparations often involves the proportion of liposomes lost during the removal of unencapsulated drug. Lab-to-lab and even day-to-day (in the same lab) variability is expected and, ideally, controlled for in science. Liposome preparation is certainly no exception, and many would argue, even more prone to this variability. Nonetheless, a majority of the thousands of published papers involving clodronate liposomes utilize liposomes which are never assayed for clodronate activity, not to mention lipid concentrations or accurate size distributions. Many of these papers report the meticulous determination of ng an pg levels of cytokines and chemokines produced by cultured cells or in vivo, yet the authors cannot accurately report the doses of clodronate liposomes used to inhibit the production of these inflammatory mediators. Many authors report the ability of a single dose of clodronate liposomes to resolve or prevent synovitis and other destructive events related to arthritis, but they do not definitively report the dose of clodronate liposomes which accomplished these effects. Who knows what we might learn if we could correlate these responses to clodronate liposome doses? 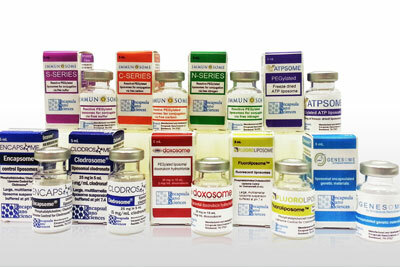 Most drugs, including clodronate, demonstrate an optimal effective dose as well as a dose response. Why do many scientists seem to believe that this is not true for clodronate liposomes? lack of intellectual property rights on the pharmaceutical development and commercialization of clodronate liposomes. Clodronate liposomes have also been used as intravenously- and intraperitoneally-delivered treatments in arthritis models. As discussed on the Intravenous administration page, smaller liposomes have been shown to target areas of inflammation, including arthritic joints, when injected intravenously, therefore systemic administration of small clodronate liposomes should result in some of the liposomes entering the inflamed synovium. When injected intra-articularly, clodronate liposomes require about a week to accomplish maximal synovial macrophage depletion, and although slow to repopulate, repopulation does begin within a couple of days post-maximal depletion. Clodronate liposomes have not been shown to affect any other cell types in the synovium with the possible exception of binding to neutrophils. The actual residence time of free clodronate or clodronate liposomes in the synovium has not been established, but control fluorescent liposomes have been visualized (presumed intracellularly located) in the synovial lining. Fluorescent liposomes have not appeared in the sub-lining nor cartilagenous tissue around the synovial space. 1. Kinne RW, Stuhlmüller B, Burmester GR. Cells of the synovium in rheumatoid arthritis. Macrophages. Arthritis research & therapy. 2007 Dec;9(6):224. 2. Barrera P, Blom A, Van Lent PL, Van Bloois L, Beijnen JH, Van Rooijen N, De Waal Malefijt MC, Van De Putte L, Storm G, Van Den Berg WB. Synovial macrophage depletion with clodronate‐containing liposomes in rheumatoid arthritis. Arthritis & Rheumatology. 2000 Sep 1;43(9):1951-9. 3. Gutman D, Golomb G. Liposomal alendronate for the treatment of restenosis. Journal of controlled release. 2012 Jul 20;161(2):619-27. 4. Van Lent PL, Van den Bersselaar L, Van den Hoek AE, Van de Ende M, Dijkstra CD, Van Rooijen N, Van de Putte LB, Van Den Berg WB. Reversible depletion of synovial lining cells after intra-articular treatment with liposome-encapsulated dichloromethylene diphosphonate. Rheumatology international. 1993 Apr 1;13(1):21-30. 5. Choy EH, Panayi GS. Cytokine pathways and joint inflammation in rheumatoid arthritis. New England Journal of Medicine. 2001 Mar 22;344(12):907-16. 6. Grossin L, Cournil-Henrionnet C, Mir LM, Liagre B, Dumas D, Etienne S, Guingamp C, Netter P, Gillet P. Direct gene transfer into rat articular cartilage by in vivo electroporation. The FASEB journal. 2003 May 1;17(8):829-35. 7. Plaas A, Li J, Riesco J, Das R, Sandy JD, Harrison A. Intraarticular injection of hyaluronan prevents cartilage erosion, periarticular fibrosis and mechanical allodynia and normalizes stance time in murine knee osteoarthritis. Arthritis research & therapy. 2011 Apr;13(2):R46. 8. Butoescu N, Jordan O, Doelker E. Intra-articular drug delivery systems for the treatment of rheumatic diseases: a review of the factors influencing their performance. European Journal of Pharmaceutics and Biopharmaceutics. 2009 Oct 1;73(2):205-18. 9. Kinne RW, Stuhlmüller B, Burmester GR. Cells of the synovium in rheumatoid arthritis. Macrophages. Arthritis research & therapy. 2007 Dec;9(6):224. 10. Larsen C, Østergaard J, Larsen SW, Jensen H, Jacobsen S, Lindegaard C, Andersen PH. Intra‐articular depot formulation principles: Role in the management of postoperative pain and arthritic disorders. Journal of pharmaceutical sciences. 2008 Nov 1;97(11):4622-54. 11. Li J, Hsu HC, Mountz JD. Managing macrophages in rheumatoid arthritis by reform or removal. Current rheumatology reports. 2012 Oct 1;14(5):445-54. 12. Lutzky V, Hannawi S, Thomas R. Cells of the synovium in rheumatoid arthritis. Dendritic cells. Arthritis research & therapy. 2007 Aug;9(4):219. 13. Pham CT. Nanotherapeutic approaches for the treatment of rheumatoid arthritis. Wiley Interdisciplinary Reviews: Nanomedicine and Nanobiotechnology. 2011 Nov 1;3(6):607-19. 14. Schett G. Cells of the synovium in rheumatoid arthritis. Osteoclasts. Arthritis research & therapy. 2007 Feb;9(1):203. 15. van den Berg WB, van Lent PL. The role of macrophages in chronic arthritis. Immunobiology. 1996 Oct 1;195(4-5):614-23. 16. Vanniasinghe AS, Bender V, Manolios N. The potential of liposomal drug delivery for the treatment of inflammatory arthritis. InSeminars in arthritis and rheumatism 2009 Dec 1 (Vol. 39, No. 3, pp. 182-196). Elsevier. 17. Zhang Z, Huang G. Micro-and nano-carrier mediated intra-articular drug delivery systems for the treatment of osteoarthritis. Journal of Nanotechnology. 2012;1-11. 18. Chopra D, Gulati M, Singh S, Duggal S, Kumar R. Use of liposomal drugs in the treatment of rheumatoid arthritis. Current Rheumatology Reviews. 2008 Feb 1;4(1):63-70. 19. Williams BD, O’Sullivan MM, Saggu GS, Williams KE, Williams LA, Morgan JR. Synovial accumulation of technetium labelled liposomes in rheumatoid arthritis. Annals of the rheumatic diseases. 1987 Apr;46(4):314-8. 20. van Lent PL, Krijger GC, Hofkens W, Nievaart VA, Sloetjes AW, Moss RL, Koning GA, van den Berg WB. Selectively induced death of macrophages in the synovial lining of murine knee joints using 10B-liposomes and boron neutron capture synovectomy. International journal of radiation biology. 2009 Jan 1;85(10):860-71. 21. Ulbrich W, Lamprecht A. Targeted drug-delivery approaches by nanoparticulate carriers in the therapy of inflammatory diseases. Journal of The Royal Society Interface. 2010 Feb 6;7(Suppl 1):S55 –S66. 22.Van Lent PL, Holthuysen AE, Van Den Bersselaar LA, Van Rooijen N, Joosten LA, Van De Loo FA, Van De Putte LB, Van Den Berg WB. Phagocytic lining cells determine local expression of inflammation in type II collagen–induced arthritis. Arthritis & Rheumatology. 1996 Sep 1;39(9):1545-55. 23. Van Lent PL, Holthuysen AE, Van Rooijen N, Van De Putte LB, Van Den Berg WB. Local removal of phagocytic synovial lining cells by clodronate-liposomes decreases cartilage destruction during collagen type II arthritis. Annals of the rheumatic diseases. 1998 Jul 1;57(7):408-13. 24. Blom AB, van Lent PL, Holthuysen AE, van den Berg WB. Immune complexes, but not streptococcal cell walls or zymosan, cause chronic arthritis in mouse strains susceptible for collagen type II auto-immune arthritis. Cytokine. 1999 Dec 1;11(12):1046-56. 25. Blom AB, van Lent PL, Libregts S, Holthuysen AE, van der Kraan PM, van Rooijen N, van den Berg WB. Crucial role of macrophages in matrix metalloproteinase–mediated cartilage destruction during experimental osteoarthritis: involvement of matrix metalloproteinase 3. Arthritis & Rheumatology. 2007 Jan 1;56(1):147-57. 26. C̆eponis, A., Waris, E., Mönkkönen, J., Laasonen, L., Hyttinen, M., Solovieva, S.A., Hanemaaijer, R., Bitsch, A. and Konttinen, Y.T., 2001. Effects of low‐dose, noncytotoxic, intraarticular liposomal clodronate on development of erosions and proteoglycan loss in established antigen‐induced arthritis in rabbits. Arthritis & Rheumatology, 44(8), pp.1908-1916. 27. Lawlor KE, Wong PK, Campbell IK, Rooijen NV, Wicks IP. Acute CD4+ T lymphocyte–dependent interleukin‐1–driven arthritis selectively requires interleukin‐2 and interleukin‐4, joint macrophages, granulocyte–macrophage colony‐stimulating factor, interleukin‐6, and leukemia inhibitory factor. Arthritis & Rheumatology. 2005 Dec 1;52(12):3749-54. 28. Piscaer TM, Müller C, Mindt TL, Lubberts E, Verhaar JA, Krenning EP, Schibli R, De Jong M, Weinans H. Imaging of activated macrophages in experimental osteoarthritis using folate‐targeted animal single‐photon–emission computed tomography/computed tomography. Arthritis & Rheumatology. 2011 Jul 1;63(7):1898-907. 29. Van Lent PL, Van den Hoek AE, Van den Bersselaar LA, Spanjaards MF, Van Rooijen N, Dijkstra CD, Van de Putte LB, Van den Berg WB. In vivo role of phagocytic synovial lining cells in onset of experimental arthritis. The American journal of pathology. 1993 Oct;143(4):1226-37. 30. Van Lent PL, van den Bersselaar LA, Van den Hoek AE, van de Loo AA, Van den Berg WB. Cationic immune complex arthritis in mice–a new model. Synergistic effect of complement and interleukin-1. The American journal of pathology. 1992 Jun;140(6):1451-61. 31. Highton J, Guevremont D, Thomson J, Carlisle B, Tucker I. A trial of clodronate-liposomes as anti-macrophage treatment in a sheep model of arthritis. Clinical and experimental rheumatology. 1999 Jan 1;17:43-8. 32. Otero M, Goldring MB. Cells of the synovium in rheumatoid arthritis. Chondrocytes. Arthritis research & therapy. 2007 Oct;9(5):220. 33. Afergan E, Epstein H, Dahan R, Koroukhov N, Rohekar K, Danenberg HD, Golomb G. Delivery of serotonin to the brain by monocytes following phagocytosis of liposomes. Journal of Controlled Release. 2008 Dec 8;132(2):84-90. 34. Torchilin VP. Fluorescence microscopy to follow the targeting of liposomes and micelles to cells and their intracellular fate. Advanced drug delivery reviews. 2005 Jan 2;57(1):95-109. 35. Torchilin VP, Rammohan R, Weissig V, Levchenko TS. TAT peptide on the surface of liposomes affords their efficient intracellular delivery even at low temperature and in the presence of metabolic inhibitors. Proceedings of the National Academy of Sciences. 2001 Jul 17;98(15):8786-91. 36. Van Lent PL, Blom AB, Van der Kraan P, Holthuysen AE, Vitters E, Van Rooijen N, Smeets RL, Nabbe KC, Van den Berg WB. Crucial role of synovial lining macrophages in the promotion of transforming growth factor β–mediated osteophyte formation. Arthritis & Rheumatology. 2004 Jan 1;50(1):103-11. 37. Van Lent PL, Holthuysen AE, Van den Bersselaar L, Van Rooijen N, Van de Putte LB, Van den Berg WB. Role of macrophage-like synovial lining cells in localization and expression of experimental arthritis. Scandinavian Journal of Rheumatology. 1995 Jan 1;24(sup101):83-9. 38. Van Lent PL, Van den Bersselaar LA, Holthuyzen AE, Van Rooijen N, Van de Putte LB, Van den Berg WB. Phagocytic synovial lining cells in experimentally induced chronic arthritis: down-regulation of synovitis by CL 2 MDP-liposomes. Rheumatology International. 1994 Apr 1;13(6):221-8. 39. Eierman DF, Yagami M, Erme SM, Minchey SR, Harmon PA, Pratt KJ, Janoff AS. Endogenously opsonized particles divert prostanoid action from lethal to protective in models of experimental endotoxemia. Proceedings of the National Academy of Sciences. 1995 Mar 28;92(7):2815-9.